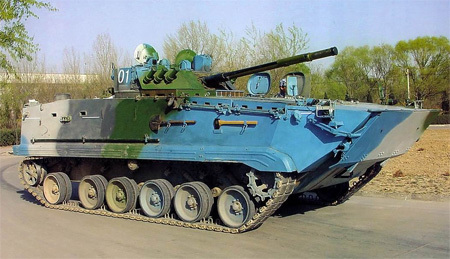 The Chinese ZBD97 Infantry Fighting Vehicle is another modern vehicle (2006) of the Chinese PLA’s armoured inventory. Firepower wise it would appear to be model on the Russian BMP-3. It has a 100mm rifled main gun with auto loader and a coaxial 30mm, with a left mounted coaxial 7.62mm MG. The 100mm fires HE-FRAG (estimated 4000m range) and 3UBK10 ATM (laser guided). The 30mm has a rate of fire of 300 rounds per/min. It can store 500 rounds of armour-piercing (AP) and HE-FRAG rounds. Its armoured protection is not known and its believed that it has an NBC system. It is equipped with a bank of 3 smoke grenade dischargers on either side of the main gun. It uses a typical crew compliment, commander and gunner in the turret, which is in the middle and driver front left in the front of the hull. To the drivers right side is the engine. All three crew have night vision equipment and the vehicle uses a modern FCS and stabilization systems for the main gun. The vehicle can carry 7 troops. The troop commander sits behind the driver on the left and the remaining 6 on benches, back to back in the rear of the vehicle. They have observation and firing ports they can shoot their personnel arms through in the sides and rear exit door. They can also exit the vehicle through hatches in the roof. The vehicle is fully amphibious and propelled in the water by two rear water jets, giving it a reported high speed. A hydraulically actuated wave fence is located at front, which, when raised, can prevent the front section of the vehicle from being overflowed during swimming. Its believed a liquid-cooled diesel engine is used, giving a maximum road speed of 65km/h and swimming speed of 20km/h. The maximum range is 500km.